For the growing number of Vermonters sympathetic to the cause of snuffing out pot prohibition in our lifetimes, there are oodles of convincing facts and figures to support their case. But is Roger Pion's act of monster-truck vengeance exacted upon the Orleans County Sheriff's Office one of them? This week, BTV Green — the pro-pot activist group that convinced the Burlington City Council to put a nonbinding referendum on cannabis legalization on the Nov. 6 ballot — unveiled its new stickers and poster art (right). 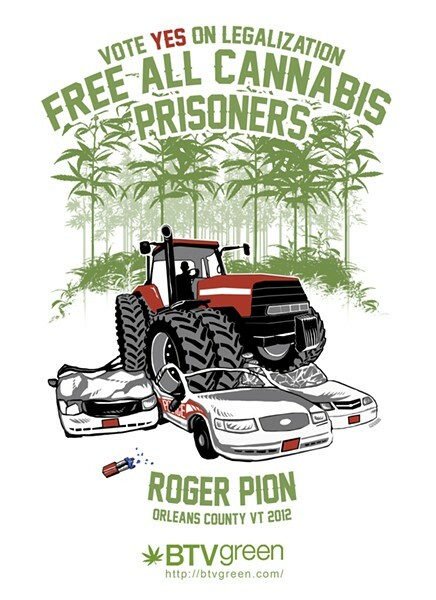 One depicts the now-iconic image of the Newport farmer driving his 10-ton tractor over eight police vehicles, reportedly in retribution for police harassment as well as an arrest for marijuana possession. Is the image a clever collectible bound to end up on the walls of countless Burlington dorm rooms and frat houses? Without a doubt. But is it the most effective message for convincing undecided voters that pot smokers are chill, nonviolent, responsible citizens? Initial damage estimates from Pion's handiwork exceeded $250,000 — not including police embarrassment over having to apprehend him on foot. "We weren't sure that anyone would be turned off by that [image]," argues BTV Green founder Albert Petrarca. As Petrarca explains, one of BTV Green's big concerns is the issue of "cannabis prisoners," — i.e., those who do time for what amounts to a victimless crime. He contends that Pion's "folklore" status, both in Vermont and internationally, addresses a serious issue with a humorous image: "Whenever an image of what Roger did shows up, the first thing that comes to people's faces is a smile of recognition, like, 'Oh, God! Wouldn't I love to have the guts to do something like that one day?'" Yet despite the image's obvious stoner appeal, Petrarca also argues that there is also something "admirable" about Pion's act of resistance, "regardless of whether you think he's more John Brown than Martin Luther King, Jr." As he points out, most cannabis prisoners are not like Pion, but are "brown and black young males who make up most of the population in our prison-industrial complex." About 100 to 150 of BTV Green's stickers went up all over town Monday night, Petrarca reports, with the rest being distributed over the next week or two in advance of the Nov. 6 vote. As this AlterNet story explains, pro-pot advocates are predicting a green revolution of another kind that day, when voters in six states will get to strike a blow against all this reefer madness.